lt;stronggt;SJMG0804lt;/stronggt;lt;BR/gt;San Jamar White Enamel Disposable Glove Dispenserlt;BR/gt;Disposable glove dispenser prevents boxes from becoming damaged or contaminated, and keep gloves sanitary and handy for use. Innovative spring-loaded amp;quot;hugamp;quot; design ensures a secure fit with glove boxes. Triple-box dispenser is ideal for holding multiple sizes of gloves. Made of 22-gauge steel with white baked enamel finish throughout. With keyholes for easy wall mounting. 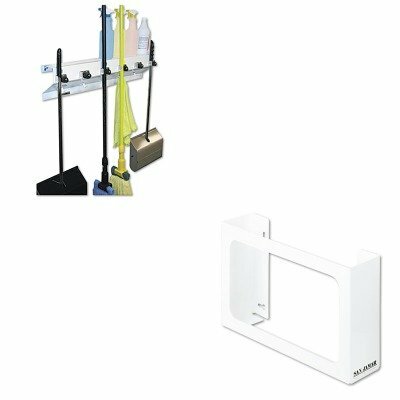 Materials: Steel Height: 10amp;quot;.lt;BR/gt;lt;BR/gt;lt;stronggt;EXC3336WHT2lt;/stronggt;lt;BR/gt;San Jamar White Enamel Disposable Glove Dispenserlt;BR/gt;Sturdy, versatile holder provides superior organization of cleaning tools and products. 4amp;quot; depth keeps supplies away from walls, preventing mop rot and wall damage. Six spring-activated, heavy-duty rubber cams provide superior grip for all types of handles. Color-coded identifier labels prevent cross-contamination and help meet NSF standards for use in a food service environment. Constructed of steel finished in FDA compliant EXL-COAT. White gloss powder coat finish. Mounting hardware included. Width: 34amp;quot; Depth: 5 1/2amp;quot; Height: 7 1/2amp;quot;.